Moltres's official artwork from Pokémon FireRed and LeafGreen. Moltres (ファイヤー, Fire) is a fictional creature in the Pokémon media franchise. Moltres's official artwork from Pokémon Red and Blue. 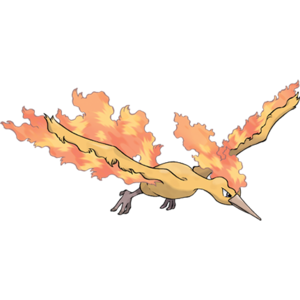 Moltres is a Fire/Flying-type Legendary Pokémon introduced in Generation I, and is categorized within the Pokédex at #146 as the "Flame Pokémon". Along with Articuno and Zapdos, Moltres is part of a trio commonly referred to as the legendary birds. It can learn Fly in every game with HM02. Moltres made a minor cameo in Super Smash Bros. as a background character. In Saffron City, very rarely, Moltres would fly by in the background. 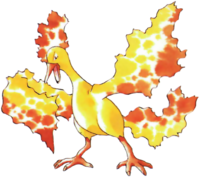 Moltres was introduced as a Poké Ball Pokémon in Melee. Moltres uses Fly as its attack. Moltres remains in the middle of the screen for a few seconds, then flies away. Any character that makes contact with Moltres will take 40% damage, and will be sent straight up and OHKO'd. There are some instances when touching Moltres in the air meteor smashes the player; however this attack can be meteor cancelled off stage. These are the only instances where someone can survive touching Moltres under normal conditions (such as teching away from Moltres upon being hit with a meteor hitbox in the air). Moltres is a legendary Pokémon, so its appearance is rare. Moltres' attack does not harm the summoner. Moltres features as a collectible trophy, unlocked as one of the trophies that can be collected randomly in the Trophy Lottery, though it only appears once all characters have been unlocked. Moltres returns to Super Smash Bros. Brawl from Melee, keeping its old function. 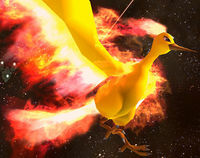 The main body of Moltres, upon being touched by a character, meteor smashes them with intense force, while the wings of Moltres send a character flying upwards, again with intense force. Just like in Melee, touching Moltres is still an invariable OHKO under standard conditions unless an airborne opponent touches Moltres' body over ground (and thus gets meteor smashed into the ground). Moltres is the only original Legendary Bird to return in Brawl. Moltres has been slightly buffed from Melee, as its body hitbox now meteor smashes instead of its wings, and since the opponent is more likely to make contact with its wings, this helps ensure against an airborne opponent surviving contacting Moltres by getting hit by the meteor smash hitbox over ground. A Flame Pokémon. It's one of the legendary bird Pokémon. When Moltres appears in a town, it is said that spring will come earlier there than in other towns. If Moltres is injured, it apparently returns to a volcano to heal its wings with magma. Moltres spreads its wide, flame-covered wings and attacks opponents with the exciting and highly damaging Sky Attack. Moltres in Super Smash Bros. for Nintendo 3DS. Moltres reprises its role in Super Smash Bros. 4 as a Poké Ball summon, functioning identically to Melee and Brawl but can no longer OHKO. Moltres's trophy appears in both versions. In Super Smash Bros. for Wii U it is part of the Kanto Region Trophy Box. Moltres is one of the three Legendary Bird Pokémon of the Kanto region, along with Articuno and Zapdos. When spreading its huge wings and taking flight, it can make the flames all over its body burn even brighter. If you get hit by those flames during its Fly attack, you might go flying even further than Moltres! Moltres returns as a Poké Ball summon once again, and makes its cameo appearance in Saffron City. In addition, it appears alongside Articuno and Zapdos as a primary spirit. Moltres cannot be summoned on Brinstar, Corneria, Find Mii, Jungle Japes, Reset Bomb Forest, The Great Cave Offensive, Tomodachi Life, Tortimer Island, Wario Ware Inc., or Yoshi's Island. Official Artwork of Moltres from Super Smash Bros. Ultimate. Moltres is the only member of the "Legendary birds" (along with its trio master, Lugia) to reappear as a Poké Ball Pokémon past Melee. Moltres is one of three legendary Poké Ball Pokémon to appear in every installment since Melee, the other two being Suicune and Lugia. This also makes Moltres the only legendary Pokémon to appear in every Smash game. 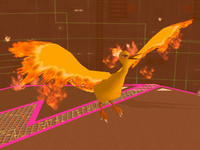 Although Moltres did appear in Super Smash Bros., it was only a cameo appearance in Saffron City. This page was last edited on April 5, 2019, at 22:56.